With the exception of Mary, the mother of Jesus, few women are more honored in Scripture than Mary Magdalene. An unfounded, but persistent legend identifies her as the unnamed, sinful woman who anointed the feet of Jesus (Luke 7:37-38), but this story has largely been discounted by modern church scholars. The next chapter of Luke's Gospel mentions Mary Magdalene as the one from whom Christ cast out "seven devils," - an indication, at the worst, of extreme demonic possession, or, more likely, severe illness. 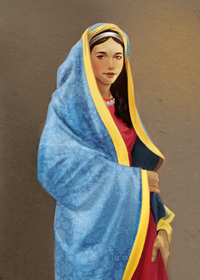 Mary probably received her name from Magdala, a place on the western shore of the Sea of Galilee near Tiberias. It seems likely that Jesus first met her while on his Galilean ministry. Many legends surround Mary, but no evidence exists to confirm any of them. According to a French tradition, for example, Mary Magdalene is identified as the Mary who is the sister of Martha and Lazarus. In this story, she accompanied Martha and Lazarus to Marseilles where the three evangelized the people of Provence. While no factual evidence supports this legend, a great devotion to St. Mary Magdalene exists today in southern France and parts of northern Italy along the Mediterranean. Mary was one of many who helped support Jesus and his apostles during Jesus' ministry (Luke 8:3). But perhaps Mary Magdalene is best remembered for her closeness to Jesus during his passion, death, and resurrection. Mary Magdalene stood at the foot of the cross with Jesus' mother and St. John. Out of all of the disciples of Jesus who might have been selected, Mary Magdalene was the first to become aware of the Resurrection when she came to Jesus' tomb early on Easter morning to anoint his body. Mary's message today: It isn't really important whether Mary Magdalene was a great sinner, possessed by demons, or very sick. What is important is that she became one of Jesus' good friends and a disciple. That is also what is important for us today: the relationship which we have with Jesus right now. What kind of a relationship do you have with Jesus? Do you consider him a friend and companion for your life’s journey?